At E3 2017, VR felt like it had matured. With no major hardware announcements, we instead saw a focus on high-profile games beginning to bubble up to the surface, with Sony and Bethesda making big splashes with their offerings. We can tell you now, Doom VFR is surprisingly good. HTC was at the show to flaunt a few demos for upcoming titles and support announcements from partners like Bethesda. As we've now marked the one-year anniversary of the Vive being on sale, we sat down with Vive's GM Daniel O'Brien to talk about what's happened so far, and what HTC wants to do with VR in year two. PS VR might be top dog in the high-end VR sales numbers right now, but Vive is estimated to be outpacing Oculus. It went out the gate with both motion controls and room scale, two things Oculus had to catch up on, which has helped Vive stay a few feet ahead. "We haven't released our headset sales numbers but we can say confidently that we hit our year one goal," said O'Brien. "We feel really confident about market share and how we penetrated the market, and we're on track for year two." Excitingly, we're also beginning to see more fleshed out, AAA games hit these VR platforms, whether that's Resident Evil 7, Fallout 4 or Star Trek: Bridge Crew. "I think we're now in a space where we're beginning to see the effects of what we did in year one with AAA studios," said O'Brien. "They can't just turn games like an indie can, now we're seeing the maturity of content come to fruition. There's more to come this year." At E3 we got to try out Intel's wireless Vive solution, which will eventually be made available as an add-on for the headset. We're also seen a version built by Chinese startup TPCast, and O'Brien said that HTC is currently working through the steps to get this launched in the US and Europe. "Initially, the wireless in 2017 we think it will be optional, people will be able to add it on," he said. "We think in 2018 it will still be optional, but it could get to the point where we start thinking about how to solve the problem for the mass consumer, we have to solve some of those bigger problems. It has to be tetherless, it has to be easier to set up. Those are things we're thinking about for future products." "Right now as we're dealing with early adopters and innovators. We're working through all those solutions, but the most important thing is making sure that it works and it works properly. I think we've landed on those key beats for the initial consumer, adopter and developers, and then we start to think of new products in the way of solving it for the next customer." O'Brien added that HTC intends to keep working with a range of partners to try out different ideas. "The thing about eye tracking and wireless and even just tracker solutions, we're gonna open ourselves up to work with a wide breadth of people, not really narrowing ourselves down to, hey this is the one and only solution, it's built in and then it's fragmented." "If we keep it open we get a lot more experimentation, we get a lot more advancement in the innovation a lot more quickly. It's allowing the market to control the speed of the innovation rather than us trying to control it all." Back at Google I/O a standalone HTC Vive headset, built in partnership with Google, stole a lot of the spotlight. So why is it choosing to go for a total standalone option? "We're building it with the Vive brand and the Vive ecosystem and the same mentality," said O'Brien, "but it's a Daydream product from a runtime and a software backend and store [perspective], and on that we wanted to partner with Google to look at a different experience that we could deliver on that promise of VR with. And thats really still important - having that ability to move around a little bit still and engage in the content. The headset will run on Daydream content and use a new type of movement tracking called World Sense, which won't require the basestations of the Vive. Of course VR is just one of HTC's interests - remember it has a pretty big investment in smartphones too. But why haven't we seen it bring the two together? "Right now we're still looking at the market and what's valuable. There's an opportunity there for an introduction to what is VR, but the Vive brand - we want it to represent the best experience at whatever layer we enter the market. So if we're to do mobile, we want it to be a really compelling experience for consumers that makes sense and is a good move from the brand. So we take the time to make sure the product is right and make sure the developer community feels like it's right for them." There's been much discussion on the merits and drawbacks for securing exclusives in VR. On the one hand, it helps developers find money in an embryonic industry; on the other, it stops those games reaching the optimum amount of headsets. To date, the Vive has avoided exclusive deals, and O'Brien promises the plan is to keep doing so. "No, we're not doing any exclusives, we don't think that's the right thing to do for the market. To lock somebody down to your platform is not healthy for the developer and so they need to be as widely distributed as they can. They need to get their brand and content and experience out there. "That's going to make the rest of the market healthier and grow faster. If its locked down it just slows it all down, it really does, you might get the funding up front but you don't get the distribution at the back end." Interestingly, O'Brien also said that other upcoming SteamVR headsets, like the one from LG, will work with games on the Viveport store, which is HTC's portal for Vive content outside of Steam. "We haven't really talked to anyone about AR yet, on what we're thinking," said O'Brien. "That's an area we're always keeping our eye on. We've been looking at AR since the year before we talked about even what we were doing in VR, so we've been working on AR for three plus years. When we have something to talk about there we will." 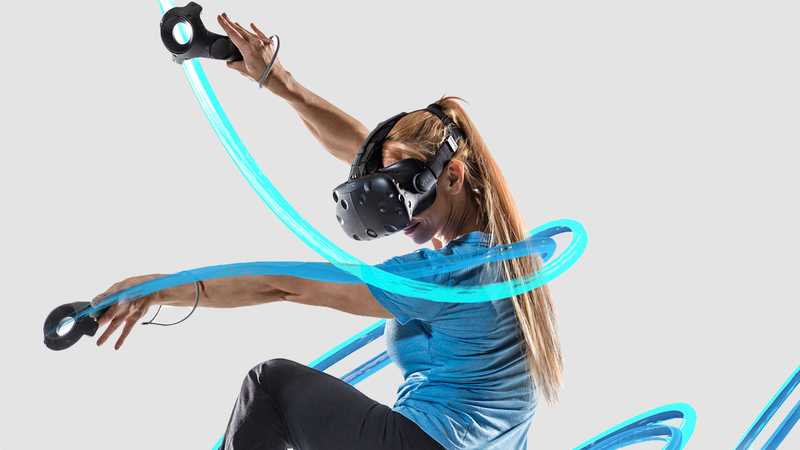 The Vive's best feature is its room-scale technology, letting you pace around in a (limited) play area. O'Brien said the plan is to make this space bigger with a second version of the Base Stations. "We feel very strongly the we have delivered the best room scale tracking experience available and that will continue. We've even started to talk about basestation 2.0 which is going to expand the area. We haven't announced what that size would be but its initially going to give you a much larger space." So, will we all need to find bigger houses? "It's not always about consumer," O'Brien responded. "Base Station 1.0 and the size of that absolutely handles consumer [VR] in your house, whereas Base Station 2.0 might handle your developer space or might handle your car room showroom, or might handle your development engineering space. There are other use cases that need larger tracking areas that aren't necessarily consumer focused."